It can’t be real. The Endangered Species Act outlaws them. Most species that have ever lived on this our glorious planet Earth have been put on permanent hiatus. And by “most” I mean something approaching, but obviously not yet reaching, every damn one of them. Some 250 million years before mankind appeared nearly all life in the oceans and a goodly portion on land was rubbed out. And this before the invention of plastic. 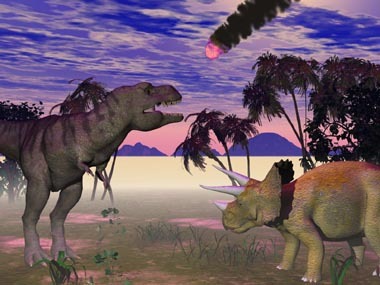 There were no journalists at the time, so the best candidate to blame for the Permian-Triassic extinction event remains unknown. This wasn’t the only horror show. Two hundred million years (or so) before the PT party was the Ordovician-Silurian extinction event which, while in earnest, couldn’t match PT’s record and only massacred two thirds of all life. And there are many, many, really very many more of these (let us unemotionally call them) incidents. The last big one was 66 million years ago when Earth, not looking in her rear-view mirror, backed into an asteroid. These things happen. What can we learn from this? That species come and species most certainly go—and sometimes they go in spectacular fashion. Incidentally, there was a theory bruited some 20 years ago which held mass extinctions were periodic with a “return period” of about 50 million years, which means we’re way past due. My opinion is that the periodicity is a statistical artifact, but I could be wrong. Plan accordingly. But as you do so, rest assured your beneficent government has taken action! Forty years ago, almost to the date (28 December), Congress got off its collective keister and did what everybody constantly demands it do: they did something. This something was the Endangered Species Act which guaranteed by law and full faith of the United States of America that, henceforth, no species shall ever go extinct again! For, as we all agree, no species should go extinct. Even though most have. According the official press release from the US Fish and Wildlife Service which somehow found its way into my in-box, the Act is (self) “credited with saving hundreds of species from extinction”. “I’m suspicious,” you might be thinking. “Give me an example.” Okay, mister, I’ll give you two: the orange foot pimpleback and the rough pigtoe. Before the government acted, there were fewer of these slimy beasties than the government thought tolerable. They say there are now, because of the Act, just the right number of them. How many of each species should there be? What a strange question! Why should you worry about that? The government, using a formula so secret that no civilian has ever seen it, has calculated the ideal number of every species which roots, crawls, burrows, swims, floats, flies, or flowers. You have a point, friend. But I for one am more trusting than you. Our government is manned by experts who, by virtue of their appointment, are virtuous and disinterested. If they say they know just how many of each species there should be and where the members of those species should live (and at what temperature), then I am prepared to believe them. A complication: new species are being discovered at a constant clip. How is it that, as scientific as we are, an animal as large as the Tapirus kabomani (about the size of a golden retriever) had to wait until last week to be spotted? I bet the government already knows the proper number of these tapirs. Some bad news: if we haven’t discovered all species, it’s therefore likely we will discover some after it’s too late and they’re already extinct. Looks like we’re going to need some stronger laws to prevent these situations. How many species need our welfare? I had a go at counting, but the government’s websites are strangely not so good. Near as I can tell, it’s somewhere north of 1,500 just in the USA, another 600+ in distant lands. Must take a lot of paperwork to track. What’s this about counterfactual arguments? The government claims it “saved” “hundreds” of species from extinction, that if it did nothing, these species would have gone extinct. But how can the government know this? It couldn’t have run an experiment. It’s possible these species could have increased without intervention. Worse, other species could have gone extinct because of the government’s actions. Beyond the obvious positive effect of arresting nutballs who shoot bald eagles, there’s no way to prove how efficacious the Act was. That’s the problem with counterfactual arguments. The side which wins them is usually that which yells the loudest. If the GMO hysterics weren’t such a pain, they could tell us about all the species saved or created. A much better metric. They’ve missed a trick. since “species” is an artifact of human definition anyway they only have to create a few new definitions and, voila!, the species is not extinct at all! Just say, “the bald eagle is the same as the white-tailed eagle” and the bald eagle is saved! I’m surprised they haven’t thought of it themselves. Briggs you may get a kick out of what posted today on cracked as well. Nate: I have not laughed that hard in a long time! What a wonderful link! Love the penguin sweaters! Actually, animals are only endangered if they fit the federal bureaucracy’s needs. Take for example the bald eagle. Now they can be whacked to bits by wind turbines because there’s more money in wind turbine plants than ranching and other activities that took out eagles. Same for whooping cranes. It’s okay to whack them now using the blades of death. Also, species are defined by their location–which I have found fascinating. If Americans move to Europe on masse, the remaining ones would be declared “endangered” and work would be done to relocate the “nearly extinct” (or extinct if everyone fled) Americans back to America where they belong. Witness the wolf. Then there’s the California condor–same as the South American one, but lives in the NH so numbers here are too low. Matters not if there are millions elsewhere. Only the Government could make such a damaging, ridiculous mess of “saving animals”. Sheri and Briggs would make a great pair. Flu: The Story Of The Great Influenza Pandemic of 1918 and the Search for the Virus that Caused It, by Gina Kolata. Long-term, never fear, “we” (some of us humans, anyway) will sooner or later develop the genetic tampering skills to resurrect (“un-extinct”) scads of species. Imagine the paradigm shift in meaning that will cause….entreaties to “save the polar bears” or whatever will simply mean to make sure someone saves sufficient samples of genetic material to drip into a few a test tubes for safe-keeping until later [whenever that turns out to be]. So much for so many grand & noble causes requiring immediate dramatic sacrificial actions…the environmentalist & other whackos will have so much less leverage to try & make everyone do what they want….there’s probably some dire unintended consequence there…. So if a bird poops out a few Rhodotypos scandens seeds in the metro Detroit region it’s okay because “oh well, that’s nature and those birds don’t know any better.” But if Billy Joe Bob’s boa constrictor escapes into the Everglades that’s not okay because “Billy Joe Bob should know better.” Sounds reasonable enough, glad I have a regulation to let me know. Tom–as long as we stay away from the subject of fashion. The endangered species act leads to nonsense like killing the Barred owl to protect the Spotted owl. The Barred owl moved into Spotted owl territory and proceeded to take over. Since the Spotted owls were a protected species that couldn’t be allowed so the forrest service set about killing the Barred owls. The only reason this stupid bird was in the way was due to the dam being built in the first place and it moved in. Also, according to the bug & bunny folks, the verio is a very stupid bird that after laying it’s eggs, left the nest to mess around elsewhere while allowing the cowbird to eat the egg contents. An evolutionary dead end… according to the bug and bunny guy. One evening, over cocktails, I confronted the bug & bunny guy… why are we protecting a bird due for extinction anyway who is only surviving becaused we built this dam and then we have to worry that he can’t move a half mile when the dam has more water that man wants to put there. AAAHHHH he says. The endangered species act is about being able to control infrastructure and development projects using worthless species to funding our studies and allows us to keep our business afloat to save more important habitat and species, like cougars, wolves and marine mammals. I agree that it is a crappy law with highly suspect statistics behind it’s *successes*. However, it’s better than continued unregulated, highly efficient free-market destruction of habitat. Have the enviro’s gone overboard… hell yes. Read Lomborg’s Skeptical Environmentalist that documents the huge improvements we have made in the environment since the 1970’s. However, you have to give the wacko’s their due for having that vicious passion required to spur evolution. The road to hell & all that? Similar issues in the UK, especially with bats. Many churches have issues with bats, roosting in their belfries & crapping all over the congregation. A window needs a batflap in it? “However, itâ€™s better than continued unregulated, highly efficient free-market destruction of habitat.” Hope springs eternal. I am curious as to when you think that the market has been unregulated, as well as the source of regulatory virtue. Okay, I’m going out of character here and agree a little bit with Howard. First, I will confess I wanted the sage grouse listed as endangered to knock out wind energy. Selfish, yes, but the act should be useful for something. Then FWS decided turbines could slice and dice eagles and avoid fines with a “permit”. Which left me to question whether listing the sage grouse would help. Not to mention the rumors that sage grouse core areas were being “moved” a bit so wind projects could to in anyway. I have no use for the ESA in most part. As noted, species go extinct and we had nothing to with the reasons why. They ran out of the ability to adapt. Simple as that. “I just have seen what happens when industry is totally unregulated.” To repeat my question, where have you seen this? Scotian: Allow me to rephrase–I have seen the aftermath of what happens when industry was/is unregulated. In Wyoming, there are over 2000 abandoned mine sites and now at least 1200 abandoned oil wells to deal with. These are not all due to lack of regulations–some are because insufficient bond was posted. Some companies abandoned wells and mines due to bankruptcy. The mines are generally left over from the days of small mines, rather than the huge, open pit mines we have now. Many of these sights pose very real dangers to people, even if we leave out the persons who died in abandoned mines after cutting a padlock or pulling out a fence and going into the mine in spite of the barriers. Scotian: Back in the pre-EPA days, industry (including municipal wastewater treatment plants) was essentially unregulated with regard to discharge of wastes to the land, water and air. This resulted in widespread damage to water and air quality. We are seeing glimpses of this in China that is like the 1950’s US on steroids. There is your example of unregulated business and the resulting tragedy of the commons. Since the Clean Water Act and the EPA was established, the US has become the cleanest industrial nation in the world and the world leader in pollution control technology. Take a look at the recent Berkeley Earth review paper on PM 2.5 pollution. The US gets a A, Europe gets a C and China/India an F.
I submit, as crazy and inefficient as US environmental regulations are, they are the best in the world and have produced the best outcomes. That is not to say that there is not mass stupidity in environmental regulation and priorities. This is why I am against the fetishization (I got that usage from Wm F Buckley) of Global Warming. It’s also why I support fracking, like Berkeley Earth. What Wm Briggs points out about the ESA are all quite true. However, because of our crazy environmentalists and conservationists, they have forced industry to do what it does best in a psuedo-free market: solve problems. In my mind, that’s great news. Of course it should be noted that your phrase ” Beyond the obvious positive effect of arresting nutballs who shoot bald eagles…” is itself an admission the greens have some point, regardless how much they abuse it. It wasn’t too long ago that shooting bald eagles got you a bounty from the government. John–wouldn’t your current comment be supporting the idea that the government has no idea what it’s doing? Let me state what I think you have shown and what I think that you have not shown. You have discussed industrial pollution that existed in the early days of technological development but you have not shown that this was due to a lack of regulation and have only assumed this. You have also not shown that the present reduction in pollution is due to more stringent regulations, rather than say technological advances and an increase in wealth. I also think that you may be reversing cause and effect and that the increase in regulation is due to regulatory capture, the EPA being essentially clueless. You also use the word “unregulated” where I think that you mean less regulated. Regulation has existed in the USA from its founding (see the whiskey rebellion) and before as part of the British Empire. You have used a very bad comparison in China, and I assume the late Soviet Union, as it would be difficult to imagine a more centrally planned, i.e. regulated, economy. Its extremely poor pollution record thus supports my position and not yours. I should also add, as I think that this point is too often missed, the problem is not so much with regulations, i.e. industrial standards, per se but with government regulation since the latter is imposed through force of arms and not the competitive market place. Force corrupts the process to the point that the opposite to the stated intentions are often produced. The EPA is an excellent example of this. Scotian: I’m not interested in your office pogie POV, it’s naive political ideology nor pedantic word games. The map is not the terrain. I seem to have hit a sore point. I’ve always thought that people commented on this website for the free exchange of viewpoints, but I see that I am mistaken in your case. This is unfortunate. Don’t know, Scotian, Howard seems to be freely exchanging his viewpoint on you. Sheri, “freely exchanging his viewpoint on you” LOL, a truly imaginative defence of the ad hominem. Scotian The ideas require merit, otherwise there is no exchange. Not a sore point, it’s just that you don’t have anything interesting to contribute other than very broad platitudes and theories. I’m more interested in the common sense view from the weeds. I would be happy to hear specifics from your first-hand personal or professional experience. Perhaps you don’t remember the days of burning rivers, dead great lakes, dying forests and killer smog. HowardW, I love the smell of pomposity in the morning. You have said that “The map is not the terrain” but you think that I am guilty of “very broad platitudes and theories”. The statement “the common sense view from the weeds” tells me nothing beyond the fact that you feel that your position should dominate which I knew to begin with. Your last post is so full of logical fallacies, which I am sure all have Latin names, that I wouldn’t know where to start. Your final statement falls broadly in the correlation is not causation category. Technological advance has made life more enjoyable and the government is always doing something in an attempt to take credit, but I see no reason to infer a causal relationship. You don’t work for the EPA by any chance? Down here, in MÃ©xico, 28 December is “dÃ­a de los inocentes”; which is kinda like your very own April fool’s.